Repairs and Troubleshooting: Having trouble with your system? Trained staff will deal with any problem that you may have from head replacements to timer and valve problems. We can find the problem and get it working properly. 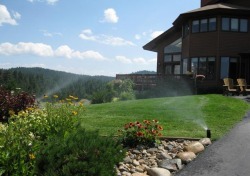 Maintenance: We can also maintain the sprinkler system for you including spring start up, adjustments of heads, watering times, and winter blowout. Find out more.